Most folks that take self-defense seriously and carry a pistol on a daily basis have trained and continue training on an individual level. But have you combined your live fire training with another person that you may spend a great deal of time with in your daily life, perhaps a spouse, coworker, or close friend? If you both are armed on a daily basis, consider the advantages of training as a team in the event of an armed attack or active shooter event. Recently, I was able to attend a course that focused on an armed situation where you and another are forced to work as a team. 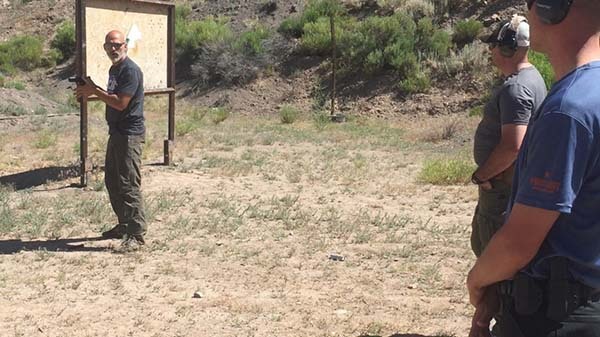 I was able to attend two back to back courses, “Combat Focus Carbine” and then “2 Person Armed Defense” (2PAD). Both were held in Colorado in June of this year. These and other courses are being offered across the nation in 2017 by Personal Defense Network (PDN) and Executive Director, Rob Pincus. 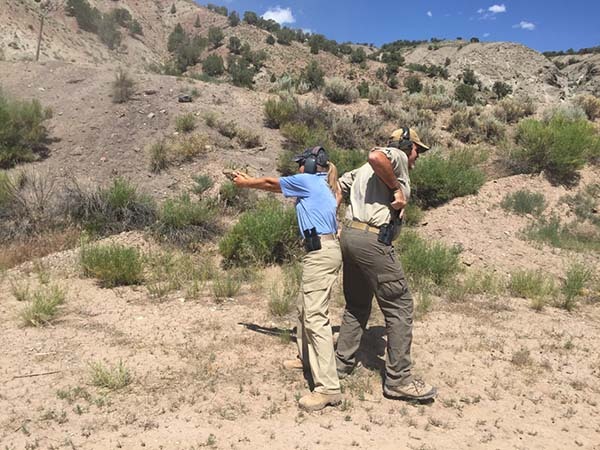 Pincus was the on-site instructor at the Gypsum, Colorado Gun Club Range. A discussion of critical firearms safety rules started off the day. Pincus then talked about what he calls the “3 C’s Foundation” of communication, coordination and cooperation when it comes to teamwork. This concept was reinforced throughout the day. Another key point made early on in the day is that an individual response is the first and a normal reaction in any high-stress event. With this concept in mind, the day’s activities focused on moving to or with your partner after your immediate response as an individual. Once we covered these basics, we moved on to a series of live fire drills, most based on two people working together. This individual drill started out the day at the five-yard line. This distance is realistic to defensive actions taken in the average armed confrontation. While in a good stance, (squarely facing the target with feet placed shoulder width apart) and a firing grip on your handgun (usually in the Sul position), the student would extend or raise the pistol while beginning trigger touch, and then press the trigger as the muzzle was on the threat/target. All the while the focus is on high center mass of the target, looking into the desired strike zone (not sighted shooting). This technique is very fast and more than combat accurate at the five- to ten-yard line. This drill was repeated several times while increasing rounds fired from two up to six. This combat focus drill is a trademark drill of PDN and Pincus. If you’re not familiar with the Sul or indoor ready position as it is sometimes called, take a look at this. This segment began to ingrain the concept of movement into defensive shooting. Each pair of students would move laterally a step or two when the shoot command was given. The movement was not necessarily the same direction but could be towards each other. The idea was to get some degree of comfort in working with another armed person with the added chaos of movement and combat-accurate fire on the threat. Movement was also encouraged after firing, which began the lead up to the next training drill: moving to your partner and then firing. In the case of you and another armed citizen not knowing where the attacker is, then moving to each other may provide an advantage. Of course the argument exists that it would then become easier for the attacker to take both of you out. I believe this drill has valid training points but ideally should be practiced on occasion with your armed partner. Primarily the drill began as one of the pair observed a threat, moved and began firing. The second of the pair would then draw and move to assist their partner (keeping the pistol in the SUL position). However the second partner would cover the 360 for additional threats and look for an escape route. The pair would literally be pressed up against each other with the “rear guard” so to speak, grabbing onto the beltline of their partner to help lead them to a more secure zone at the first opportunity. If the partner shooting ran dry on ammo or had a malfunction they would call for the “rear guard” to rotate towards the threat to engage. While this drill may sound uncomfortable I found it to have real-world applicability and a way to shape thinking of an effective response should the need ever arise. Throughout the day we continued to strengthen all drills by working through doorways and around vehicles, always with a partner. Pincus likes to stress an immediate and individual startled response, which is very probable in the real world. A drill that the students performed that helped instill this surprised response was the figure 8 drill. A pair of students would move in a figure 8 (crossing each other's paths) parallel to the targets. Upon Pincus calling out numbers (numbers were drawn on targets with a marker) the pair would turn towards threats (targets), which were scattered at different distances, and then engage the appropriate numeral(s) with multiple shots. Each student would address only those threats on their appropriate side. This drill was dynamic and as close to realism to having to find the threat and engage as any I’ve done, especially while working with another armed citizen. During the day and for all drills Pincus stressed the importance of a good 360-degree scan. Scan for what you might ask? As Pincus put it in order of priority: additional threats, other armed citizens or law enforcement that you don’t want to get shot by, additional folks that may be willing to help you or others in some way, and then a position of advantage, whether it be cover, a clearer shooting position, or other tactical advantage. Expect to expend about 400 to 500 rounds of ammunition in 2PAD over a full day of training. This course was a different approach than many courses I have attended, especially from a civilian perspective. It gave me food for thought in the realm of working with or around another armed person and I would not hesitate to attend again. I have trained in law enforcement both as a student and as an instructor for decades now. If there is one piece of advice I could give to any student of defensive living and mindset, it would be to keep challenging yourself with good training and a proper attitude. Rob Pincus and Personal Defense Network did just that. Did you know we recently had Rob Pincus on our Concealed Carry Podcast and our Monthly Guardian Nation Live Broadcast? If you don't know what Guardian Nation is, make sure you check it out! Great review of this course, Thanks Terry! 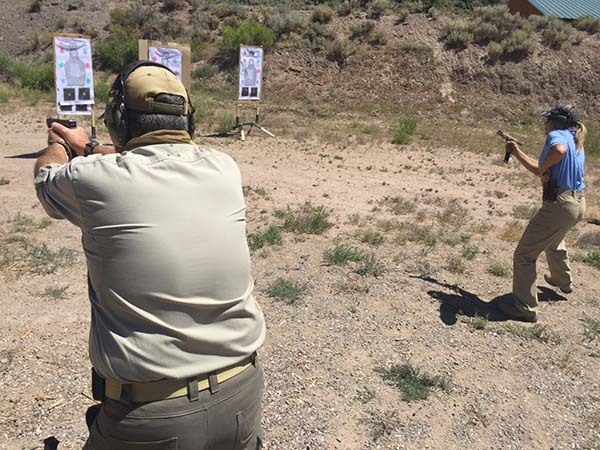 This year’s PDN Training Tour offered the most diverse collection of courses we’ve ever offered. One of the more unique courses that was taught in a few locations across the country was I.C.E. Training’s Two Person Armed Defense. A Team Tactics Course specifically designed for the everyday person who spends a lot of time with other people who are armed. 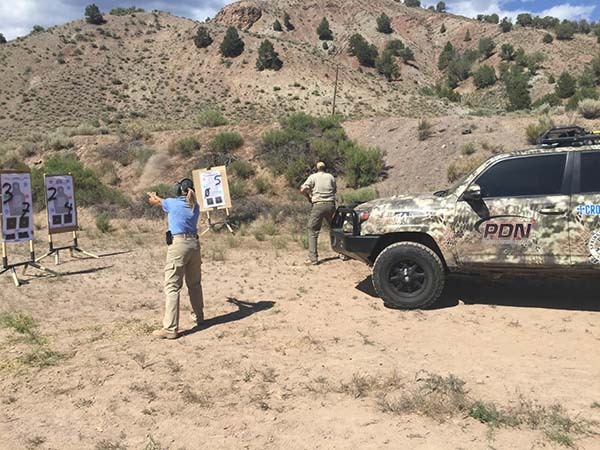 It is not a fantasy camp class where students pretend to be SWAT Team Members or perform bounding overwatch across open ranges with burning cars and smoke grenades creating great photo ops, but no practical value. 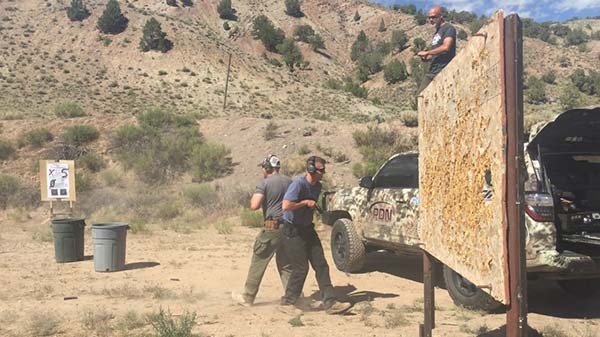 This course draws from various aspects of Team Tactics in the world of Armed Professionals, but the curriculum is pared down simple fundamentals that can be applied under a wide variety of circumstances in the even that two (or more) Good Guys with Guns end up involved in the same incident. As the number of people carrying guns for defense continues to grow, this becomes more and more likely and this coursework becomes more and more important. I/m also a retired LEO and qualify yearly under the HR-218 Fed Bill -for LEOSA. 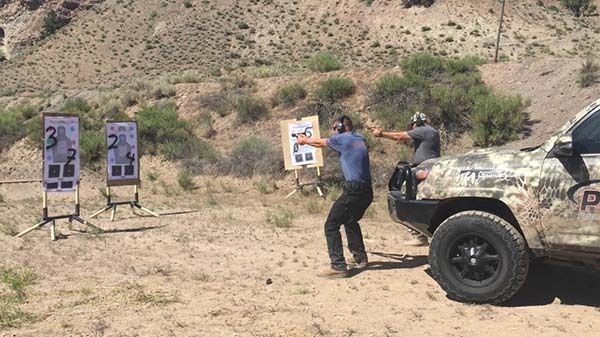 Its been awhile since I trained with a partner but it is a good idea to train with a armed partner safely and in a tactical order of targets by threat and correct fan of fire for each shooter. Thank you for your wisdom and valuable training lessons. 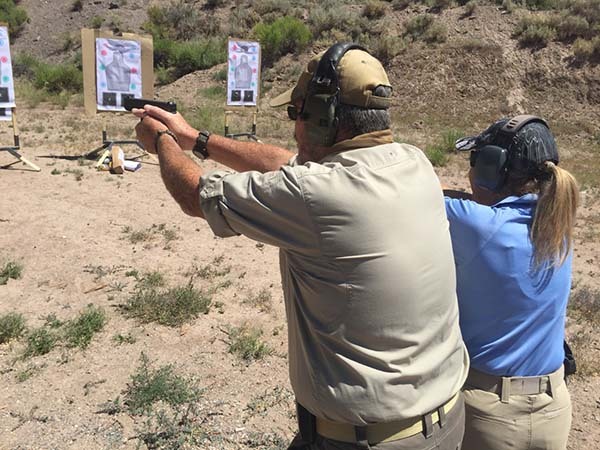 Retired LEO–Greg Powell & IDPA & NRA member.